Please join us for the 2nd Annual Pitman Art Stroll along Broadway in Uptown Pitman. Spend time enjoying an outdoor Art Exhibit of local and regional artists. 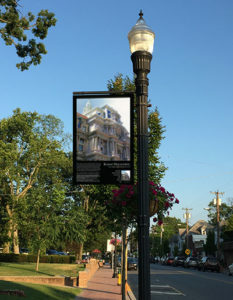 The art will be shown as 24″x36″ posters that are displayed on the lamp posts along both sides of Broadway, starting at Laurel Avenue and ending at Holly Avenue. The opening reception will be held on Friday, September 1 from 6-8 pm at Pitman Gallery & Art Center located at 59 S. Broadway, Pitman. Join us from 6pm – 8pm for the opening reception, meet the artists, enjoy complimentary locally sourced wine, food & refreshments, live music and more. This event is free and open to the public. During your stroll, be sure to stop by Pitman’s friendly shops and restaurants. This event is free to the public and will be on display from September 1st to September 30th, 2017. Don’t forget to bring friends and family!